• Cleveland High School – Portland, Oregon, USA – Studies with Prof. Larry Nobori; high school diploma, 1984-1985. • Youthsound Big Band – Portland, Oregon, USA – Big band training and concerts with conductors Thara Memory and Greg McKelvey, 1984-1985. • Terni Jazz University – Terni, Italy – Studies with pianists Rita Marcotulli and Mike Melillo; big band training and concerts with conductor, composer and arranger Bruno Tommaso, 1987-1988. • Siena Jazz Clinics – Siena, Italy – Studies with pianist Franco D’Andrea; jazz ensemble training with Tomaso Lama and Claudio Fasoli; scholarship award, 1989-1990. • CPM Siena – Siena, Italy – Studies with pianists Enrico Pieranunzi and Stefano Battaglia, 1990-1991. • Orchestra Giovanile Italiana – Studies with Bruno Tommaso, Giancarlo Gazzani and Marcello Piras, 1992. • IASJ International Meeting – Siena, Italy – Studies with pianist Louis Vidal; jazz ensemble training with Dave Liebman, Ronan Guilfoyle and Rick Peckam, 1993. • Jazz piano workshops with Franco D’Andrea (1981) and Walter Bishop Jr (1997). • Jazz ensemble workshops with Lew Tabackin (1985), Bruce Forman (1988), Miroslav Vitous (1988), and Jack Walrath (1998). • Maria Grazia Trontino – Classical piano, Fabriano, Italy (1974-1976). • Nedda Spotti – Classical piano – Fabriano, Italy (1977-1980). • Eddie Wied – Jazz piano – Portland, Oregon, USA (1984-1985). • Enrico Pieranunzi – Classical and Jazz piano – Rome, Italy (1990-1991). • Emilio Procaccini – Classical piano – Fabriano, Italy (1992). • Aki Montoya – Tablas and North Indian musical theory – Rome, Italy (2004-2006). • Siena Jazz Clinics – Siena, Italy – Scholarship, 1989. • Rotary Club – Cittadella, Italy – “New Talents” Prize, 1993. • “Juan Le Pins-Antibes Jazz Festival” – Juan Le Pins, France – International contest dedicated to vocal Jazz – 3rd Prize with the “Ciara Arnette Jazz Quintet”, 2003. • Castello di Argignano – Fabriano, Italy – Recognition of merit (winner in the Junior’s category), 2009. • Radio FIP – Paris, France – “Sélection FIP” for album “Météores”, 2011. • Harmonia Mundi Switzerland – “Sélection HMCH” for album “Météores”, 2011. • Italian magazine “JazzIt” – “JazzIt Likes It!” for album “Waxin’ in Camerino”, 2011. • “15th Annual Latin Grammy Awards” – nomination as “Best MPB Album” for CD “InventaRio incontra Ivan Lins”, 2014. • InventaRio: with Dadi (vocals, guitars, mandolin, electric bass), Ferruccio Spinetti (vocals, double and electric basses, guitar), Francesco Petreni (drums, percussions); original songs, classics of the Italian and Brazilian repertoire; CD ”InventaRio” (artistic production by Ceccarelli and Spinetti, My Favorite Records, 2010), CD “InventaRio incontra Ivan Lins” (artistic production by InventaRio; released by Blue Note/EMI Music Italy, 2012; released in Brazil by Biscoito Fino; nominee at the “15th Annual Latin Grammy Awards” as “Best MPB Album”, 2014); concerts in Italy – 2009-. • Historias: with Ferruccio Spinetti (double bass); original compositions and music by Mesolella, Barbieri, Dalla – 2018-. • Daniele di Bonaventura & Giovanni Ceccarelli: with Daniele di Bonaventura (bandoneón); original compositions and arrangements; new CD to be released in 2014; concerts in Italy – 2012-. • Marcello Allulli & Giovanni Ceccarelli: with Marcello Allulli (tenor sax); live soundtrack to silent movie “Cenere”, original compositions and own arrangements of music by Pascoal, Jobim, Montoya, Kern; performances in Italy, France, Portugal, India – 2006-. • Pagine Vere: with Michela Lombardi (vocals) and Luca Falomi (guitars); original compositions – 2019-. • Giovanni Ceccarelli Trio: with Mauro Gargano (double bass) and Patrick Goraguer (drums); original compositions and own arrangements of music taken from the jazz, Brazilian and Italian repertoire; CD “Météores” (Bonsaï Music, 2011); concerts in France, Italy, and Lebanon – 2010-. • Giovanni Ceccarelli Solo: Giovanni Ceccarelli – piano, clavietta, whistle; original compositions and arrangements; concerts in Italy – 2007-. • Concerts for Syria: Giovanni Ceccarelli – piano, clavietta, whistle plus guest artists; events for the benefit of association Life4Syria; original compositions and arrangements; concerts in Italy, France, Switzerland – 2016-. • Voices: with Andrea Dulbecco (vibes), Salvatore Maiore (double bass), and Paolo Orlandi (drums); original compositions – 2019-. • Blas Gimeno & Giovanni Ceccarelli: with Blas Gimeno – images, film direction; own videos – 2008-. • Giovanni Ceccarelli Quartet, with Christophe Panzani (tenor and soprano saxes), Nicolas Rageau (double bass), Antoine Paganotti (drums); original compositions; album “Daydreamin'” (Magnatune, 2010). • Inner Urges, with Fabrizia Barresi (vocals); original compositions, own arrangements of music from different musical traditions; CD “Feedin’ Inner Urges” (Quantum Jazz Music, 2009); concerts in Italy and France – 2007-2009. • Giovanni Ceccarelli Quintet, with Piercarlo Salvia (tenor an soprano saxes), Massimo Morganti (trombone), Pietro Ciancaglini (double bass), Lorenzo Tucci (drums); original compositions; concerts in Italy – 2003-2005. • Eddie Wied & Giovanni Ceccarelli, with Eddie Wied (piano), Frank Larosa or Giordano Pietroni (double bass), Ron Steen or Massimo Manzi (drums); original compositions, jazz standards; CD “The Street Dancer” (Philology Records, 1998); concerts in Italy and the U.S.A. – 1997-1999. • Giovanni Ceccarelli Trio, with Stefano Cantarano, Giordano Pietroni or Mauro Battisti (double bass), Massimo Manzi, Francesco Vitale or Carlo Battisti (drums); original compositions, jazz standards; concerts in Italy – 1992-2002. • Mokambo Jazz Trio, with Luigi “Lullo” Mosso (double bass), Mirko Sabatini (drums); original compositions, jazz standards, music of Thelonious Monk; concerts in Italy – 1988-1991. Mauro Gargano “Nuages”, “Animantiga” with Stéphane Casalta and the late Roberta Alloisio, Claudia Carvalho and Piero Delle Monache Quartet, Federica Altieri “Roma Patria Comune”, Piero Delle Monache Quartet, Sandra Cartolari. • Massimo Urbani – 1989-1992 (release of CD “The Nights of the Beuscher” as a co-leader). • Tony Scott Group, 1991. • Tiziana Ghiglioni Group, 1996-97 and 2001 (participation in 2 CDs by this group). • Mayto Torres y su orquestra (salsa), 1996-1997. • Velotti/Battisti Jazz Ensemble – 1997-2007 (participation in 1 CD by this group). • “Concerto per Leopardi” – Musical lecture in collaboration with the Italian actor Arnoldo Foà and the Velotti/Battisti Jazz Ensemble, 1998-2005. • “Beyond the Horizon” – Performance involving poetry, theater, dance and music, Warsaw, Poland, 1999. • Ciara Arnette Quartet – 2000-05. • Toni Germani Trio – 2003-2004 and 2006 (participation in 1 CD by this group). • Trioakì – Fusion of jazz and Indian classical music, with Aki Montoya and Marcello Allulli, 2003-2005. • “Jazz: Istruzioni per l’Uso” – Orchestra conducted by Massimo Nunzi, 2004. • “Bukowski : confessions of a genius” – Musical lecture in collaboration with the Italian actor Alessandro Haber, 2005. • Marcello Sebastiani Fourtet – 2000-2008 (participation in 1 CD by this group). • Historias Trio – Original music and songs from Brazil, Cuba, with Marcello Allulli and Ferruccio Spinetti or Chris Jennings, 2008-2009. • “Due mondi che s’incontrano” – Concert with the singer Amii Stewart and the flutist Andrea Griminelli, 2008-2009. • Antonello Sorrentino S.T. Quintet – 2008-2010 (participation in 1 CD by this group). • Paolo Fresu – 2011 and 2013 (participation to a TV program). • Enrico Rava, Mark Murphy, Benny Golson, Bob Wilber, Charles Davis, Manu Katché, Giacomo Gates, Marco Tamburini, Tiziano Tononi, Frank Dela Rosa, Carlo Atti, Emanuele Cisi, Brad Wheeler, Gianni Basso, Pietro Tonolo, Antonello Salis, John Stowell, Garrison Fewell, Nancy King, Larry Smith, Joe Magnarelli, Jim Snidero, Gianni Coscia, Ettore Fioravanti, Rosario Bonaccorso, Rosario Giuliani, Attilio Zanchi, Agostino Di Giorgio, Gianni Cazzola, Gianluca Petrella, Massimo Moriconi, Amii Stewart, Stefano “Cocco” Cantini, Massimo Nunzi. Participations in festivals, concert seasons and club venues. • “Gaume Jazz Festival” – Belgium, 1993 (with Giovanni Ceccarelli Quartet); “Aarau Jazz” – Switzerland, 1998 (with Enrico Rava Quartet); “Jazz Jamboree” Warsaw – Poland, 1999 (with performance “Beyond the Horizon”); “Festival de Jazz en Touraine”, “Grenoble Jazz Festival”, “Crest Jazz Vocal”, “Jazz à Ramatuelle” (with Ciara Arnette), “Semaine Italienne”, “Festival Jazz sur Seine”, Sunset/Sunside Jazz Club – (with Giovanni Ceccarelli Trio and Daniele di Bonaventura/Giovanni Ceccarelli) – France 2003-2018; Italian Cultural Institute in Budapest – Hungary, 2007-2008 (with Ada Montellanico); Festivals “Jazz San Fermin” in Pamplona and “Ciudad de Toledo” in Toledo – Spain, 2009-2010 (with Benny Golson & Giovanni Ceccarelli Trio and Kenny Wheeler & Giovanni Ceccarelli Trio); “8 1/2 Festa do Cinema Italiano” – Cascais, “Dia Europeo das Linguas” – Óbidos, Portugal, 2016, 2018 (with Marcello Allulli/Giovanni Ceccarelli); “Jazz at Bran Castle” – Bran, Romania, 2016 (with Daniele di Bonaventura/Giovanni Ceccarelli); Odin Teatret – Holstebro, Denmark, 2016 (with performance “Roma Patria Comune”); “Elijazzen Festival” – Hamnoy, Norway, 2017 (with Daniele di Bonaventura/Giovanni Ceccarelli); “Akordeono Festivalis”, Vilnius, Lithuania, 2017 (with Daniele di Bonaventura/Giovanni Ceccarelli); concerts in Slovenia, Austria, Germany, Liechtenstein, Luxembourg. • “Ravello Festival” – Ravello (SA) (with InventaRio incontra Ivan Lins); “Ancona Jazz” – Ancona (with Musica Nuda/InventaRio, Enrico Rava, Mark Murphy); “Macerata Jazz” (with Musica Nuda/InventaRio); “Le Strade del Jazz” – Chiaravalle (AN) (with Ada Montellanico); “Casa del Jazz” – Rome (with Ada Montellanico); “Jazz & Image – Villa Celimontana” – Rome (with Marcello Allulli/Giovanni Ceccarelli with Chris Jennings, Ada Montellanico, Mario Raja Big Band, “Roma Patria Comune”); “Dolce Vita Jazz Festival” – Rome (with Ada Montellanico); “La Notte Bianca” – Rome (with “Jazz: Istruzioni per l’Uso” directed by Massimo Nunzi); “Rassegna Jazz al Teatro dell’Opera” – Rome (with Ada Montellanico); Teatro Molière (with Arnoldo Foà & VBJE); “Mediterranea Festival” – Rome (with Federica Altieri, Tony Scott & Trioakì); “Reggio Parma Festival” – Parma (with Amii Stewart); “Pescara Jazz Winter” – Pescara (with Lee Konitz); “Udin&Jazz” – Udine (with Letizia Felluga, Tiziana Ghiglioni), “Verbania Jazz” – Verbania (with Tiziana Ghiglioni); “Crossroads” – Fusignano (RA), Reggio Emilia (with Daniele di Bonaventura/Giovanni Ceccarelli, Ada Montellanico), “Pomigliano Jazz” – Pomigliano d’Arco (NA) (with Ada Montellanico); Italian Jeunesses Musicales (with Giovanni Ceccarelli Trio, Daniele di Bonaventura/Giovanni Ceccarelli, Ada Montellanico, Tiziana Ghiglioni); AGIMUS – Terni (with Ada Montellanico); “I Mercoledì del Conservatorio” – Alessandria, 2016 (with Marcello Allulli/Giovanni Ceccarelli); “Associazione Musicale Meranese” – Merano, 2016 (with Daniele di Bonaventura/Giovanni Ceccarelli); “Il Jazz Italiano per Amatrice” – Casa del Jazz, Rome, 2016 (in solo); “Festival Léo Ferré” – San Benedetto del Tronto (AP), 2016 (with Daniele di Bonaventura/Giovanni Ceccarelli); concerts in the following renowned jazz clubs: Alexanderplatz Jazz Club, La Palma, St. Louis Jazz Club – Rome, Cantina Bentivoglio – Bologna. • “Heineken EuroJazz Festival in Beyrouth”, Blue Note – Beirut; Italian Cultural Institute – Tripoli, Lebanon, 1998/2000 (with VBJE); “Jazz Talks” Festival (with Giovanni Ceccarelli/Paolo Orlandi), “European Film Festival” (with Marcello Allulli/Giovanni Ceccarelli) – Beirut, 2014. • “Sensorium” Festival – Sunaparanta, Panjim, Goa, India 2015 (with Marcello Allulli/Giovanni Ceccarelli with Matteo Fraboni); JKK – Jaipur, KC Music Conservatory – Chennai, Italian Cultural Institute and “Festival of the Arts” India International Centre – Delhi, The BFlat Bar – Bangalore, Victoria Memorial Hall – Calcutta, India, 2016 (with Marcello Allulli/Giovanni Ceccarelli with Matteo Fraboni). • Berklee College of Music – Boston, Massachusetts, USA (with Garrison Fewell/Giovanni Ceccarelli); Willamette University – Salem, Oregon, USA, 1999 (with Stan Bock/Giovanni Ceccarelli); Jazz at the Opus – Portland, Oregon, USA; Italian Cultural Institute – Cordoba, Buenos Aires, Mar del Plata, Argentina, 2002 (with Toni Germani Trio); “Euro Jazz” Festival, Istituto Italiano di Cultura – Mexico City; “Festival de Jazz de Michoacàn” – Morelia, Mexico, 2003 (with Toni Germani Trio). • “Italian Jazz Festival”, Bennett’s Lane – Melbourne, Australia, 2003 (with Marcello Sebastiani). • “Thunupa African Tour” – concerts in Addis Ababa (Ethiopia), Libreville (Gabon), Nairobi (Kenya), Maputo (Mozambique), Johannesburg and Cape Town (South Africa), Harare (Zimbabwe), 2013 (with Piero Delle Monache Quartet); Italian Cultural Institute, Algeri, Algeria, 2016 (with Daniele di Bonaventura/Giovanni Ceccarelli). Participations in radio and television programs. • Radio programs “Invenzioni a due voci” and “Battiti”, Radio RAI Tre, Italy, 2003; “Brasil”, “Suoni e Culture dal Mondo”, Radio RAI Uno, Italy, 2009-2018; “Jalla-Jalla” at Radio Popolare, Italy, 2010; “Voulez vous sortir avec moi ?”, France Inter, France, 2010; “Summertime”, France Inter, France, 2011; “Musicalement Votre”, Radio Aligre, France, 2011; “Les Invités d’Arièle”, France Music, France, 2011; “Le 20h de TSFJazz”, TSFJazz, France 2011; “Jazz a Nota Libera”, TeleRadioStereo, Italy, 2011. • Tv programs for RAI International, Italy 2000; “One Shot Not”, Arte, France 2011; “Orient-Occident”, Syrian National Television, 2011; “Télématin”, France 2, France 2011. • Spot for MasterCard with Italian composer and arranger Massimo Nunzi, 2008. • Giovanni Ceccarelli, “Météores” (Bonsai Music – Japanese release by Production Dessinée), 2011 (as leader, pianist, composer, and arranger). • Giovanni Ceccarelli, “Daydreamin’” (Magnatune), 2010 (as leader, pianist, composer, arranger, and producer). • Ivan Lins/Giovanni Ceccarelli/Dadi/Francesco Petreni/Ferruccio Spinetti, “InventaRio incontra Ivan Lins” (Blue Note/EMI Music Italy – Brazilian release by Biscoito Fino – nominee at the “15th Annual Latin Grammy Awards” as “Best MPB Album”, 2014), 2012 (as co-leader, pianist, keyboardist, arranger, and artistic co-producer). • Lee Konitz & Giovanni Ceccarelli French Trio, “Waxin’ in Camerino” (Philology), 2011 (as co-leader, pianist, composer, and co-producer). • Giovanni Ceccarelli/Dadi/Ferruccio Spinetti, “InventaRio” (My Favorite Records – Japanese release by Rip Curl Recordings), with Ivan Lins, Marisa Monte, Petra Magoni and Pacifico, 2010 (as co-leader, pianist, keyboardist, composer, arranger, and artistic co-producer). • Fabrizia Barresi/Giovanni Ceccarelli, “Feedin’ Inner Urges” (Quantum Jazz Music), 2009 (as co-leader, pianist, composer, arranger, and co-producer). • Massimo Urbani/Giovanni Ceccarelli, “The Nights Of The Beuscher” (Philology), 2009 (as co-leader and pianist). • Giovanni Ceccarelli/Eddie Wied, “The Street Dancer” (Philology) recorded in the USA, 1998 (as co-leader, pianist, composer, arranger, and co-producer). • Claudia Carvalho, “Velho Continente” (Da Vinci Jazz), 2018 (as pianist). • Toni Germani, “Canzoni in Scatola/Songs in a Box” (Slam Productions), 2016 (as pianist). • Piero Delle Monache, “Aurum” (Parco Della Musica Records), 2014 (as pianist). • Agorà, “Ichinen”, 2013 (as pianist, keyboardist, and composer). • Stefano Cantarano, “Walk in Progress Ensemble” (Domani Musica), 2011 (as pianist). • Francesco Giannelli, “Occhi” (AlfaMusic), 2011 (as pianist, keyboardist, composer, and arranger). • Piero Delle Monache, “Welcome” (Altotenore), 2010 (as pianist and composer). • Antonello Sorrentino S.T. Quintet, “Blog” (Wide Sound), 2009 (as pianist, composer, and arranger). • Ada Montellanico, “Omaggio a Billie Holiday” (Jazz Italiano Live), with Stefano “Cocco” Cantini, 2008 (as pianist, composer, and arranger). 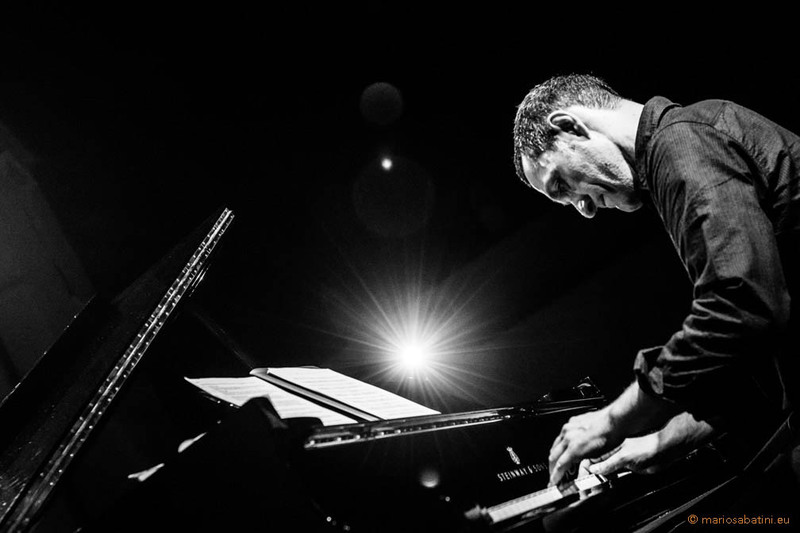 • Fabrizio Cecca, “Southern Avenue Project” (Cristal), with Nicola Stilo, 2008 (as pianist). • Francesca Merloni, “Elice” (Deca), 2007 (as pianist and composer). • Toni Germani, “Blues ballate canzoni” (Splasch), 2005 (as pianist). • Elvio Ghigliordini, “Alterabile” (III Millennio) with Ada Montellanico, Joy Garrison and Claudia Marss, 2004 (as pianist and keyboardist). • Marcello Sebastiani, “Desiderio” (Splasch), 2003 (as pianist). • Elvio Ghigliordini, “Fluttin’ on Jazz” (Domani Musica) with Nicola Stilo, 2002 (as pianist). • Enrico Ghelardi, “Lost Love” (Domani Musica), 2002 (as pianist). • Ada Montellanico, “Suoni Modulanti” (Abeat) with Fabrizio Bosso and Max Ionata, 2002 (as pianist, composer, and arranger). • Lee Konitz, “At the New Mississippi Jazz Club”, (Philology) 2002 (as pianist). • Enrico Bracco, “Going Wes” (Philology), 2001 (as pianist). • Sandra Cartolari, “Twolips”, 1999 (as pianist, composer, and arranger). • Velotti-Battisti Jazz Ensemble, “I Canti di Leopardi” (Micromega) with Arnoldo Foà, 1998 (as pianist). • Tiziana Ghiglioni, “Tenco in Jazz” (Philology), 1998 (as pianist). • Mayto Torres y su Italian Salsa, “Salsando Salsando” (Duck Records), 1998 (as keyboardist). • Piero Delle Monache, “Road Movie” (Da Vinci Jazz), 2017 (as pianist). • Francesco Petreni, “Prima” (Wide Sound), 2016 (as pianist). • Various artists, “No Foot Just Music” (Bonsaï Music), 2016 (as pianist, composer, and featured artist). • Bandão, “Incontri” (Bandão/Entropya), 2015 (as pianist and featured artist). • Various artists, “My Summer in Jazz” (Bonsaï Music), 2014 (as pianist and featured artist). • Daniele di Bonaventura, “Eleven Projects”, 2013 (as pianist and featured artist). • Maria Gadú, “Nós” (Som Livre), 2013 (as pianist and featured artist). • Agorà, “Ichinen”, 2013 (as keyboardist, composer, and arranger). • Gnu Quartet, “Something Gnu” (Bonsaï Music), 2011 (as pianist and guest soloist). • Various artists, “Jazz al Dente” (Bonsaï Music) with Giovanni Ceccarelli French Trio, 2010 (as pianist, composer, arranger, and featured artist). • Massimo Nunzi/Elena Somarè, “La Grande Storia del Jazz” (DVD L’Espresso) with Ada Montellanico and Pietro Ciancaglini, 2009 (as pianist). • Nancy King, “Moonray” (Philology), 1999 (as pianist). • Tiziana Ghiglioni, “My Essential Ellington” (Philology) with Tony Scott and Lee Konitz, 1998 (as pianist). • “Musiques Tangentes” School of Music – Piano, jazz piano, music theory and ensemble music courses – Malakoff, 2007-2008. • “C.I.M.” School of Music – History of jazz course – Paris, 2009. • Private Courses for “Allegro Musique” association – Jazz and Modern Piano – Paris, 2007-2009. • “Ecole des Arts” – Jazz piano and vocal coaching courses, assistant for the choir courses – Marcoussis, 2009-2010. • Conservatoire Raoul Pugno – Jury at Jazz piano class exams – Montrouge, 2010, 2015, 2018. • CIAC Musica – Jazz piano course – Rome, Italy, 1991-1993. • Fare Jazz – Jazz piano course – Chiaravalle, Italy, 1994. • Scuola Comunale di Musica – Jazz piano, improvisation, ensemble courses – Orte, Italy, 1994-2004. • “Sentieri Sonori” clinics – Jazz piano, improvisation and ensemble courses – Fabriano, Italy, 1995-1997. • “InJazz Summer clinics” – Jazz piano, rhythm workshop, jazz ensemble, vocal ensemble, vocals and piano workshop – Arcevia and Fabriano, Italy, 1999-2011. • Istituto Pergolesi – Jazz piano course – Ancona, Italy, 2001-2003. • Scuola Comunale di Musica “B. Padovano” – Jazz piano course – Senigallia, Italy, 2004. • Scuola Comunale di Musica “L. Mancinelli” – Jazz piano course – Orvieto, Italy, 2004-2007. • “Ancona Summer Jazz Festival” – Dance and music workshop on improvisation – Ancona, Italy, 2005. • “SpringInJazz Music Seminars” – Jazz ensemble courses – Labro, Italy, 2008. • University of Macerata – Lecture on teaching jazz and improvisation – Fermo, Italy, 2010. • National Music Conservatory “A. Vivaldi” – Jazz piano and piano for jazz instrumentalists and vocalists courses – Alessandria, Italy, 2015. • Lake Music Center – Jazz piano course – Lake Oswego, Oregon, USA, 1997. • Berklee College of Music – Jazz improvisation lecture – Boston, Massachusetts, USA, 1999. • French Cultural Center – Jazz piano and improvisation courses – Damascus, Syria, 2011. • President and founding member of the “InJazz” Cultural Association “InJazz” organizing “Incontri con il Jazz” music festival (11 editions), “InJazz” Summer clinics (13 editions), “SpringInJazz” music seminars (3 edition), and “Tra le Quinte” music festival (5 editions) – Arcevia, Fabriano, Labro, and Osimo Italy, 1999-2013. • Member of the “Marchinjazz” Cultural Association – 2012-2017.